Our commitment is to ship your orders as quickly as possible. Usually, your orders will be entered, completed and processed for delivery within a few hours of receiving them. We will process your order without delay. We will always send you an email confirming the status of your order. Orders received by 2 p.m. Pacific time are usually shipped the same business day. Orders received after 2 p.m. or on weekends will usually ship the next business day unless special arrangements are made for overnight or weekend delivery. Once your order has shipped, we will send you an email notification that will include your delivery tracking number. You will be able to track your orders online. 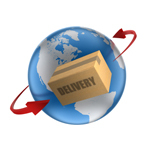 International orders received by 2 p.m. Pacific time are usually shipped the same business day. For international shipments, the shipping time depends on the delivery location and customs clearance time at the country of destination. International customers may be subject to import duties and taxes, which are levied once the package reaches your country. Additional charges (if any) for customs clearance must be paid by you. We have no control over these charges and cannot predict what they may be. Customs policies vary widely from country to country. If you want to figure out customs duty & local taxes imposed by your country, please visit this very useful website www.DutyCalculator.com It will calculate and provide you with the exact quote your local customs duty & taxes. To avoid any misunderstandings see what and how much you are going to pay (if any) upon arrival of your parcel to your country. A 100% refund to your original source of payment within 30 calendar days of receipt of your order. Once you receive your item(s) please examine them carefully. If you wish to return your item, please notify us immediately through email: [email protected] or call us 1 866 446 0062. Following notification and "RM authorization", goods must be shipped back to us within the order cancellation period: this commences upon receipt of your item(s) and ends 30 calendar days later (returns must be postmarked within 30 calendar days of receipt). Shipping charges for goods returned for a refund are the customer's responsibility. Items which have been returned in line with the "Terms & Conditions" * will be credited to the original source of payment within 3 business days. Exchange/return within 30 days from the purchase date. To simplify merchandise exchange process please place a new order for the new item(s) you want. Then call our customer service at 1 866 446 0062 or email to: [email protected] to get return/exchange authorization and a prepaid FREE shipping label to send the item(s) back to us as a return. The reasoning for placing a new order is simple. Our products are not mass-produced. In fact, we offer only handmade, limited production items and our stock is always limited. Our products are in high demand. If you send back the item you want to exchange before placing a new order for the new item(s), there is no guarantee we will have what you want at the time when your return/exchange merchandise arrives at our warehouse. Therefore, placing a new order assures "100% real time" availability. When you call or email customer service, please state your new order number so we can file the return as an exchange. As soon as we receive your returned/exchanged merchandise at our "returns warehouse", a full refund will be issued within 24 hours for "New and unused" merchandise. "New and unused" means that there are no scratches or marks on the item and there are no signs of wear on the product. We will not accept merchandise with the smell of tobacco or perfume. Our merchandise comes directly from the fine Italian designers and manufacturers. All items offered for sale are documented and guaranteed to be new and authentic. All items are thoroughly inspected before they are shipped to you**. If you have a question or problem, please contact us prior to placing your order or immediately after its receipt. We will do everything possible to accommodate you and to resolve any open issues. Your satisfaction is our prime concern! We cannot accept a return of any item with any indication that it has been used. All returned items must be in the brand new unused condition with all hang tags attached & in the original dust bags and packaging. "New and unused" means that there are no scratches or marks on the item & there are no signs of wear on the product. We will not accept merchandise with smell of tobacco or perfume. We reserve the right to refuse return of any merchandise that does not meet our return requirements, and in such event, the items will be shipped back to your address, at your expense. ** All our product descriptions, measurements & images are very accurate. Certain types of leathers have natural characteristics that sometimes may be mistaken as "imperfections". Please be assured, you always receive from us 100% authentic, quality merchandise. We are striving to ensure that the item colors shown on this website are as close to the real colors as possible. However, the exact item colors may vary depending on a number of different factors (time of day, method of lighting & your computer monitor’s settings).